Domestic 2018: 'Hanging Low' - NUTS Down Under! We opened Studio One up to some of our most beautiful, talented Nutters to showcase some amazing, original work! 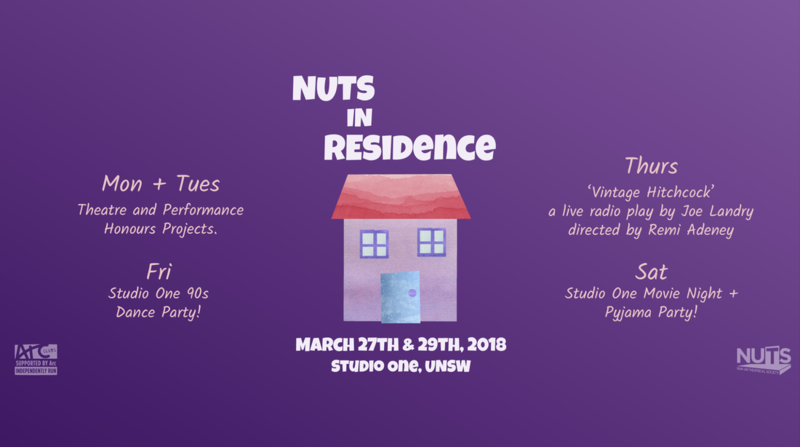 With Honours Projects on Tuesday night and a Live Radio Play on Thursday, there was something for everyone! Later in the week we had some bangin' social events, including a 90's themed dance party and a pyjamas-only movie night! Miss out on Short and Sweet? Have an overwhelming amount of salt and no way to get rid of it? Short and Salty showcased four vastly different short plays with plenty of variety!